UPDATE [8:45 PM, 31/3/17 IST]: The problem Matrix Challenge has been corrected. In order to be eligible for prizes, please download the Fleep app and create a Fleep account and fill up this form by clicking here. Do you feel nostalgia on hearing "Hello World!"? 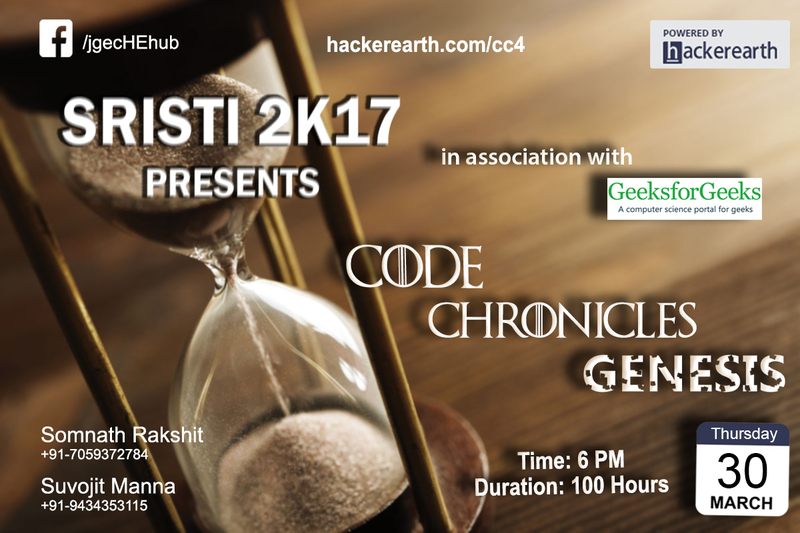 Sristi 2k17, in association with Campus Geeks Connect - GeeksforGeeks, brings you an opportunity to unleash your coding skills. Sit in front of your monitors and feel the rush of adrenaline during this 100 hour long coding extravaganza called Code Chronicles: Genesis. Code Chronicles: Genesis is the fourth edition of Code Chronicles, JGEC's flagship algorithmic coding championship. This is a contest organized under Srsiti 2K17, the largest techno management fest of North Bengal, hosted by Jalpaiguri Government Engineering College. Jalpaiguri Government Engineering College (JGEC) is a premier institute for quality technical education in India. Established in 1961, the college has produced many talented engineers till date. It holds the distinction of being the second oldest engineering college in West Bengal. JGEC is affiliated to West Bengal University of Technology (WBUT), and the courses conducted by it have the approval of the All India Council for Technical Education (AICTE) and accredited by the National Board of Accreditation (NBA). The College conducts Bachelor's degree (B. Tech) in six branches and Master's degree (M. Tech) in two branches of Engineering. The College is located in the outskirts of Jalpaiguri Town, the Divisional Headquarters of seven Districts of North Bengal. 1. This is an individual event. 2. The two top rankers will win attractive prizes. 3. The competition will start sharp at 6 PM on 30th April 2017 and end at 00:00 AM on 4th April 2017. No request to change the contest timings will be entertained. 4. There will be no time penalty on account of incorrect submission. The leader-board will automatically reflect this in real-time. 5. All programming languages supported by HackerEarth are allowed in this competition. 6. Additional rules may be imposed from time to time. All contestants must strictly adhere to the Code of Conduct. 7. In case of any conflicts, the decision of the challenge admins will be final and binding.